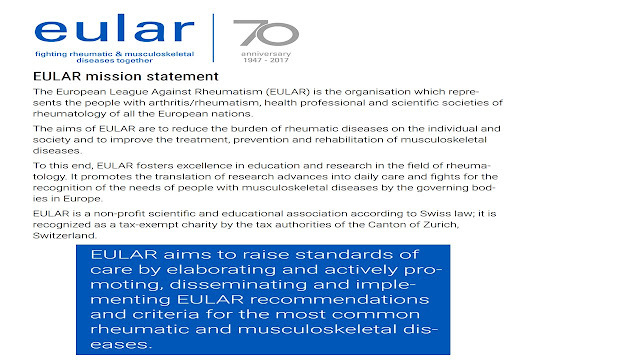 Raynauds Scleroderma Global Patients: EULAR Recommendations For The Treatment of Systemic Sclerosis, Scleroderma, Raynaud’s, Autoimmune Rare Disease. 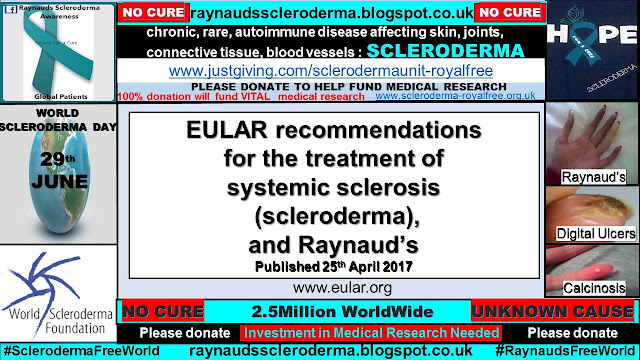 EULAR Recommendations For The Treatment of Systemic Sclerosis, Scleroderma, Raynaud’s, Autoimmune Rare Disease. The task force consisted of 32 SSc clinical experts from Europe and the USA, 2 patients nominated by the pan-European patient association for SSc (Federation of European Scleroderma Associations (FESCA)), a clinical epidemiologist and 2 research fellows. All centres from the EULAR Scleroderma Trials and Research (EUSTAR) group were invited to submit and select clinical questions concerning SSc treatment using a Delphi approach. Raynaud’s phenomenon (RP), digital ulcers (DUs), pulmonary arterial hypertension (PAH), skin and lung disease, scleroderma renal crisis, and gastrointestinal involvement. Compared with the 2009 recommendations, the 2015 recommendations include phosphodiesterase type 5 (PDE-5) inhibitors for the treatment of SSc-related RP and DUs, riociguat, new aspects for endothelin receptor antagonists, prostacyclin analogues and PDE-5 inhibitors for SSc-related PAH. New recommendations regarding the use of fluoxetine for SSc-related RP and haematopoietic stem cell transplantation for selected patients with rapidly progressing SSc were also added. These updated data-derived and consensus-derived recommendations will help rheumatologists to manage patients with SSc in an evidence-based way. These recommendations also give directions for future clinical research in SSc. Based on the published evidence and expert opinion, 16 updated recommendations regarding pharmacological treatment of SSc-specific organ involvement were formulated. It should be recognised that the field of management of patients with SSc is larger than pharmacological management alone. Management of SSc also includes (early) diagnosis of the disease, early diagnosis of internal organ involvement, identification of patients at risk of development of new organ complications and deterioration of the disease, as well as non-pharmacological treatments, of which most of are beyond the scope of this project. There are also several (potential) drugs, including new promising therapies that might be helpful in management of patients with SSc that could not be included in these evidence-based recommendations due to insufficient data at present. Dihydropiridine-type calcium antagonists, usually oral nifedipine, should be considered for first-line therapy for SSc-RP. Phosphodiesterase type 5 (PDE-5) inhibitors should also be considered in treatment of SSc-RP. In view of costs and feasibility, the experts recommended that intravenous prostanoids are considered when oral therapies (including calcium channel blockers and PDE-5 inhibitors) have failed. As most drugs used for treating RP may induce vascular side effects, the experts recommend particular attention if prostanoids are combined with other vasodilators. Recommendation: Fluoxetine might be considered in treatment of SSc-RP attacks. Recommendation: Intravenous iloprost should be considered in the treatment of DUs in patients with SSc. Recommendation: PDE-5 inhibitors should be considered in the treatment of DUs in patients with SSc. Considering the fact that oral prostanoids showed lower efficacy for treatment of SSc-related RP, as compared with intravenous iloprost (see section on RP), the experts decided, based on the results of the aforementioned two RCTs, to recommend intravenous iloprost as a treatment for DUs in patients with SSc. Further studies are required to confirm beneficial effect of intravenous iloprost in prevention of development of DUs in patients with SSc. In view of risk of side effects and route of administration usually requiring hospitalisation, intravenous iloprost should be considered in particular in patients with SSc with DUs not responding to oral therapy. In severe cases, combination therapy with oral vasodilator and intravenous iloprost can be used. However, the increased risk of side effects should be taken into account. Side effects of PDE-5 inhibitors are discussed in the previous paragraph regarding PDE-5 inhibitors in the treatment of RP. Based on these data, the experts concluded that PDE-5 inhibitors can be efficacious in treating SSc-related DUs. Whether other than tadalafil PDE-5 inhibitors can prevent development of new DUs in patients with SSc needs to be clarified in further studies. Recommendation: Bosentan should be considered for reduction of the number of new DUs in SSc, especially in patients with multiple DUs despite use of calcium channel blockers, PDE-5 inhibitors or iloprost therapy. At present, there is insufficient evidence that endothelin receptor antagonists (ERA) have beneficial effects on SSc-RP attacks either. There are two major concerns related to the use of bosentan and other ERA: potential liver injury and teratogenicity. Hormonal contraceptives may not be reliable if co-administered with bosentan, because bosentan may reduce their efficacy by interference with the cytochrome P450 system. In view of the results of both RAPIDS trials and considering potential toxicities associated with bosentan, experts recommend usage of bosentan especially in patients who have multiple DUs despite treatment with other vasodilators such as calcium channel blockers, PDE-5 inhibitors and iloprost to prevent the development of new DUs. Recommendation: ERA, PDE-5 inhibitors or riociguat should be considered to treat SSc-PAH. Experts recommend that ERA, selective PDE-5 inhibitors and riociguat should be considered in the treatment of SSc-PAH in agreement with international guidelines regarding treatment of PAH. This has been underlined by the publication of the recently published new guidelines of the pulmonology and cardiology societies. In severe or progressing PAH cases combination therapy with different PAH-specific drugs should be taken into account. Although at the time of developing these recommendations RCTs comparing combination therapy with PAH-specific drugs versus monotherapy in patients with SSc-PAH were lacking, this approach is in line with recent guidelines of the European cardiology and pulmonology societies regarding management of PAH in general, and seems particularly important in patients with SSc-PAH known to have more progressive disease than patients with other forms of PAH. Recommendation: Intravenous epoprostenol should be considered for the treatment of patients with severe SSc-PAH (class III and IV). Prostacyclin analogues should be considered for the treatment of patients with SSc-PAH. Despite the lack of specific RCTs evaluating these drugs exclusively in patients with SSc, experts recommend that these prostacyclin analogues should be considered for treatment of SSc-PAH, in agreement with international guidelines for PAH treatment. The experts concluded that combining different classes of PAH-specific therapies may be considered in the treatment of selected patients with SSc-PAH, especially in those with severe or progressing disease. This approach is in line with recently published guidelines regarding management of PAH in general, and seems particularly important in patients with SSc-PAH known to have more progressive disease than patients with other forms of PAH. Recommendation: Methotrexate may be considered for treatment of skin manifestations of early diffuse SSc. Thus, the experts confirmed the earlier recommendation for methotrexate in early diffuse SSc. It should be recognised that cyclophosphamide (CYC) has also been shown, in RCTs, to improve skin changes in patients with SSc, and other agents such as mycophenolate mofetil or azathioprine are used to treat skin involvement, although their efficacy has not been studied extensively. Recommendation: In view of the results from two high-quality RCTs and despite its known toxicity, CYC should be considered for treatment of SSc-related interstitial lung disease (SSc-ILD), in particular for patients with SSc with progressive ILD. As in the previous 2009 recommendations there was unanimous consensus of the experts with respect to the CYC dose and duration of treatment to be tailored individually dependent on the clinical condition and response. Potential risks of bone marrow suppression, teratogenicity, gonadal failure and haemorrhagic cystitis must be always considered. Recommendation: Haematopoietic stem cell transplantation (HSCT), should be considered for the treatment of selected patients with rapidly progressive SSc at risk of organ failure. In view of the high risk of treatment-related side effects and of early treatment-related mortality, careful selection of patients with SSc for this kind of treatment and the experience of the medical team are of key importance. In view of the results of the two RCTs and considering the risk of potential treatment-related mortality and morbidity experts recommend that HSCT should be considered for the treatment of selected patients with rapidly progressive SSc at risk of organ failure. To reduce the risk of treatment-related side effects, HSCT should be performed in selected centres with experience in this kind of treatment. Careful evaluation of the benefit to risk ratio in individual patients with SSc selected for HSCT should be done by experts. Further studies should help to identify subgroups of patients with SSc in whom HSCT would be most beneficial. Considering the potential risk of SRC associated with steroid use experts recommend that patients with SSc treated with steroids should be carefully monitored with respect to the development of SRC. Large, specific RCT for the efficacy of PPI in patients with SSc are lacking. A small RCT indicated that PPI may improve upper GI symptoms in patients with SSc. documented in meta-analyses of RCTs. In asymptomatic patients with SSc, PPI should be used with caution since long-term therapy with PPIs might lead to nutritional deficiencies, possibly due to reduced intestinal absorption, or increased risk of infections. The experts conclude that all available prokinetic drugs can be applied to patients with SSc with GI involvement on an individual basis, in consideration of potential benefit to risk ratio. Recommendation: Intermittent or rotating antibiotics should be used to treat symptomatic small intestine bacterial overgrowth (SIBO) in patients with SSc. In addition to the recommendations, experts formulated a research agenda which addresses usage of pharmacological treatments in SSc or SSc-related organ complications which were considered of particular interest. This research agenda can be helpful in developing further clinical research in SSc. 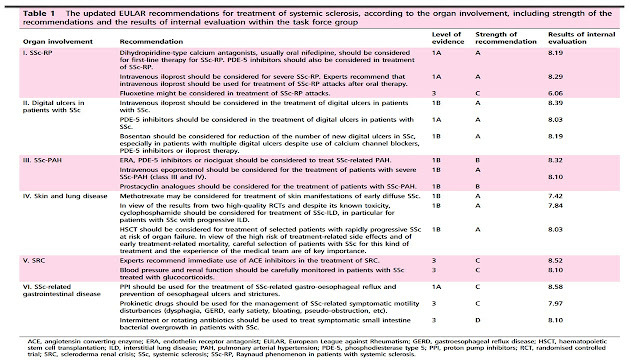 As compared with the previous (2009) EULAR recommendations for treatment of SSc, the updated recommendations include several new treatments for specific SSc-related organ involvement. The greatest changes have been made in treatments of vascular complications of SSc and mirror the progress which had been made in this field during the last several years. These include the introduction of PDE-5 inhibitors for SSc-related RP and DUs, riociguat and new aspects for ERAs, prostacyclin analogues and PDE-5 inhibitors for SSc-PAH. The new recommendation regarding the use of fluoxetine for SSc-related RP was also added. With regard to treatment of other than vascular complications of SSc, the recommendation for HSCT for selected patients with rapidly progressive SSc at risk of organ failure has been added. Similar to the 2009 recommendations, the present recommendations address only pharmacological treatments which were considered most relevant and received consensus from the expert panel. As SSc is an uncommon and clinically heterogeneous disease, appropriate testing of therapies is difficult. Indeed, evidence supporting the present recommendations is often limited and some of the recommendations are supported by the evidence extrapolated from studies involving patients with diseases other than SSc or are based solely on expert opinion. Similar to the 2009 recommendations, there is still not sufficient data, to make specific recommendation for paediatric patients. It would be important to have studies at least for the effective paediatric dose of each medication, to be safely applied. It should be recognised that there are several other promising therapies, including immunosuppressive drugs or new biological agents which could not be included in the present recommendations because the evidence for their efficacy was considered insufficient at the time of developing these recommendations. The results of RCT evaluating new therapies in patients with SSc which were published after closure of the systematic literature research are presented in online supplementary table S4. The first of these trials evaluated the efficacy of sildenafil in DUs healing in patients with SSc and is addressed in the comment following recommendation concerning treatment of DUs. Another double-blind, phase 2 RCT involved 87 patients with early diffuse SSc and elevated acute phase reactants. Treatment with tocilizumab (subcutaneous 162 mg/week) was associated with a favourable trends in skin score improvement as compared with placebo after 24 weeks (p=0.09) and 48 weeks (p=0.06). In addition, encouraging changes in FVC were noted. In view of promising effects of tocilizumab on skin and lung involvement, it is concluded that further studies are warranted before definitive conclusions can be made about its risks and benefits in SSc. The results of another RCT, the SLS 2 comparing mycophenolate mofetil with CYC in patients with SSc-ILD are expected to be published soon. The preliminary results of this study, recently published as an abstract of the 2015 ACR annual congress, indicate that mycophenolate mofetil (up to 3 g/day orally for 2 years) was comparable with oral CYC (2 mg/kg/day for 1 year followed by matching placebo for the second year) with regard to FVC course at 24th month. However, final conclusions regarding the place of mycophenolate mofetil in the treatment of SSc-ILD cannot yet be made. Other therapies, considered promising by the experts, were addressed in the research agenda. Since ‘lack of evidence of efficacy’ does not imply that ‘efficacy is absent’ the absence of positive recommendation regarding specific drug should not be interpreted as a contraindication for its use. It should also be emphasised that there are other treatment options, such as education, physiotherapy or local management of ischaemic lesions which were beyond the scope of the project or could not be included in the present recommendations due to lack of consensus among the experts. In conclusion, it is believed that these updated recommendations will help to improve care of patients with SSc in an evidence-based way and indicate direction for further clinical research. Considering the significant complexity and heterogeneity of SSc and the limited evidence for treatments, it is recommended that patients with SSc should be referred to specialised centres with appropriate expertise in SSc management.